Water activity (aw) is a measurement of the energy status of the water in a system. The value indicates how tightly water is “bound,” structurally or chemically, within a substance. Water activity is the relative humidity of air in equilibrium with a sample in a sealed chamber. The concept of water activity is of particular importance in determining product quality and safety. Water activity influences color, odor, flavor, texture and shelf-life of many products. It predicts safety and stability with respect to microbial growth, chemical and biochemical reaction rates, and physical properties. Why Measure Water Activity? Water activity is the best index for microbial growth. A product may contain a relatively large percentage of moisture, but if the water is chemically “bound” with the addition of humectants or solutes, such as salts, sugars, or polyols, the water is biologically unusable for the microbial growth processes. The water activity concept has served microbiologists and food technologists for decades and is the most commonly used criterion for food safety and quality. Microorganisms have a limiting aw below which they cannot grow. Since water activity describes the thermodynamic energy status of the water within a system, there is a close relationship between water activity and the physical stability and shelf life of products. Differences in water activity levels between components or a component and the environmental humidity is a driving force for moisture migration. Knowledge of whether water will absorb or desorb from a particular component is essential to prevent degradation, especially if one of the substances is moisture sensitive. For example, if equal amounts of component 1 at 2% and component 2 at 10% moisture content are to be blended together, will there be moisture exchange between the components? The final moisture content of the blended material would be 6%, but did any moisture exchange between component 1 and 2? The answer depends on the water activities of the two components. If the water activities of the two components are the same, then no moisture will exchange between the two components. There are several factors that control water activity in a system. Colligative effects of dissolved species (e.g. salt or sugar) interact with water through dipole-dipole, ionic, and hydrogen bonds. Capillary effect where the vapor pressure of water above a curved liquid meniscus is less than that of pure water because of changes in the hydrogen bonding between water molecules. Surface interactions in which water interacts directly with chemical groups on undissolved ingredients (e.g. starches and proteins) through dipole-dipole forces, ionic bonds (H3O+ or OH-), van der Waals forces (hydrophobic bonds), andhydrogen bonds. It is a combination of these three factors in a food product that reduces the energy of the water and thus reduces the relative humidity as compared to pure water. These factors can be grouped under two broad categories osmotic and matric effects. As a potential energy measurement it is a driving force for water movement from regions of high water activity to regions of low water activity. Examples of this dynamic property of water activity are; moisture migration in multidomain foods (e.g. cracker-cheese sandwich), the movement of water from soil to the leaves of plants, and cell turgor pressure. Since microbial cells are high concentrations of solute surrounded by semi-permeable membranes, the osmotic effect on the free energy of the water is important for determining microbial water relations and therefore their growth rates. Relationship Between Water Content and Water Activity. The relationship between water content and water activity is complex. An increase in water activity is usually accompanied by an increase in the water content, but in a nonlinear fashion. This relationship between water activity and moisture content at a given temperature is called the moisture sorption isotherm. For most foods, the isotherm is sigmoidal in shape, although foods that contain large amounts of sugar or small soluble molecules have a J-type isotherm curve shape. Many different equations are utilized to characterize a product’s isotherm relationship. For small water activity ranges, linear regression can describe an isotherm relationship, but it rarely works for the entire water activity range. More complex equations are used to characterize the isotherm for the entire water activity range. The most common equations are the Guggenheim-Anderson-de Boer (GAB) and Brunauer-Emmett-Teller (BET) equations. Like linear regression, these equations are adjusted to find coefficients that do the best job of explaining the isotherm relationship. Data analysis software programs are used to determine these coefficients, which then can be used to predict the moisture content at any water level or vice versa. Why Measure both Water Activity and Moisture Content? 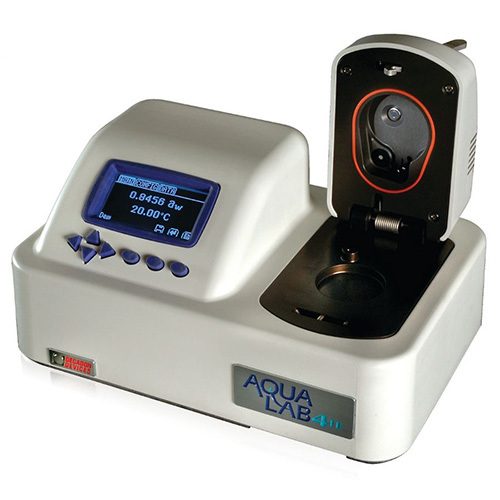 While moisture content and water activity measurements individually provide necessary information, they are most effective when used together as a complete moisture analysis. For example, the moisture content associated with a water activity value may not be the same if a product adsorps water (starting from the dry state) or desorps (starting from the wet state) water. This phenomenon of different aw vs. moisture values for adsorption and desorption is called moisture sorption hysteresis and is exhibited by many foods. This information is critical to anyone drying or wetting a product. Both moisture content and water activity are needed to determine if a product exhibits hysterisis. A complete moisture analysis can also assist in optimizing formulations. Through formulation adjustments, it is possible to change the moisture content of a product at a given water activity. By comparing the moisture contents of the different formulations, it is possible to choose the formulation that has a higher moisture content, but still maintains a safe water activity level. In this example, moisture content provides information about concentration and moistness while water activity provides information about safety, quality, and shelf life. The result is a moister product that is still shelf stable. In addition, this product would weigh more with no additional work or energy costs. A complete moisture analysis can result in higher revenues at lower costs, all for selling water.